Located on historic Lydiard Street in the heart of Ballarat, Craig’s Royal Hotel is the legendary Australian gold-rush era grand hotel. Built in 1862 on the site of Bath’s Hotel, Ballarat’s first officially licensed pub, Craig’s has been a goldfield icon since Prince Alfred, Duke of Edinburgh, slept in its ornately decorated rooms in 1867 and Dame Nellie Melba famously sang from its balcony in 1908. Now, after 5 years extensive restoration, the magnificent accommodation, dining, meeting and banquet facilities are re-establishing Craig’s as the finest boutique heritage hotel in the region. Recognised as one of regional Australia’s most prestigious; wedding venues, Craig’s Royal Hotel is the perfect combination of historic charm, tradition and innovation. Over 6 years restoration and refitting works have created a wedding venue, unmatched in the region. Stunning bridal suites, luxurious guest accommodation and beautiful settings throughout the hotel allow for one of a kind photo opportunities. Food will impress with bespoke menus created – formal dinner or cocktail style – by head chef Shannon Easton capturing the best of regional flavours and produce and a wide selection of local and Craig’s own cellar wine collection. Restoration of 41 elegant suites and rooms bedecked with antiques and with a touch of the 21st Century. The tower suite has sweeping views across Lydiard street and an elaborately carved 600-year-old Chinese wedding bed. Craig's Royal Hotel, built in 1862, is a 5-star hotel in the Central Highlands of Victoria, Australia. 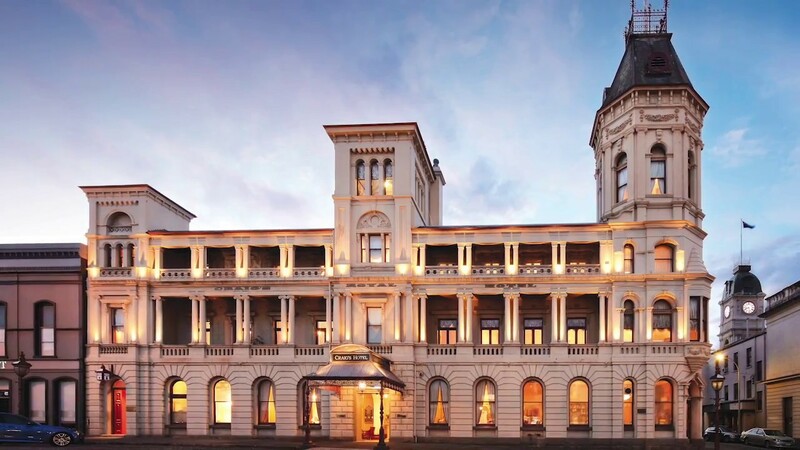 The gold-rush era grand hotel is located on historic Lydiard Street in the heart of Ballarat. Prince Alfred, Duke of Edinburgh, slept in Craig's Royal Hotel in 1867, and Dame Nellie Melba sang from its balcony in 1908. The hotel hosts weddings for up to 110 people in several spaces. The Grand Dining Room is decorated in late nineteenth century Empire style. The room has a high ceiling, fine wallpaper, and chandeliers. The Prince’s Room is distinguished by a coffered ceiling. The Reading Room is a split level room with a balcony while the Bluestone Cellar showcases contrasting bluestone and timber. The venue’s culinary team creates bespoke menus, formal dinner or cocktail style, capturing the best of regional flavours. Food is paired with wine, chosen from a wide selection of local wine or Craig’s own cellar wine collection. Craig's Royal Hotel has 41 plush rooms with ornate furnishings. Upgraded rooms add extras like balconies and whirlpool baths. The tower suite has an elaborately carved 600-year-old Chinese wedding bed. Amenities include a bistro with a sunroom and courtyard and a posh cocktail bar. Ballarat, part of Victoria’s Goldfields, has leafy boulevards that are lined with heritage buildings. Interesting sites in the area include the Art Gallery of Ballarat, Sturt Street Gardens, Ballarat Wildlife Park, Kryal Castle, and the Museum of Australian Democracy at Eureka. Absolutely beautiful venue to have everything in! We had the ceremony, pre dinner drinks, reception and photos all done in the one place! The staff were amazing and we had so many compliments on the food and hotel itself. We recently had the pleasure of holding our wedding at the Craigs Royal Hotel. From the moment you enter the Craigs you feel transported back in time to a bygone era, the decor and attention to detail is simply stunning.The meals were sensational, full credit to the chef, the staff were friendly, courteous and very efficient. We found the service and amenities first class, cant wait to return. An old style hotel that was really nice, they were really accommodating with our requests such as early check in and delivering breakfast to our room instead of us having to go downstairs. Great service, amazing room.. Perfect way to spend our wedding night! It was forty years in the making! On a brisk day in June, my long time partner and I were married. (It's not that we were procrastinating, rather, the law did not permitted us to do so). At first we were a little unsure if we would feel comfortable here, but the staff quickly put us at ease, making us feel relaxed and "special"! We soon learnt that the function organiser was not only efficient, but took care of everything. The food was beyond our expectations and our guests were delighted with the whole afternoon. We could not think of a better place or setting, to meet our needs. The coming together of family and friends in this magnificent building was something we will remember for a long time. Thank you to Deanne and staff at Craig'e Hotel. Our wedding at Craig's royal hotel in July 2018 was amazing. Deanne and the staff at Craig's were wonderful, the staff were professional and experienced. We had our service in the long room over looking Lydiard Street and our reception in the Grandball room. Food was amazing and service was great. We also had guests staying at the hotel, who all spoke so highly about how wonderful the venue was and couldn't fault any thing about the whole weekend.